After a crowd pleaser with a luxurious twist? 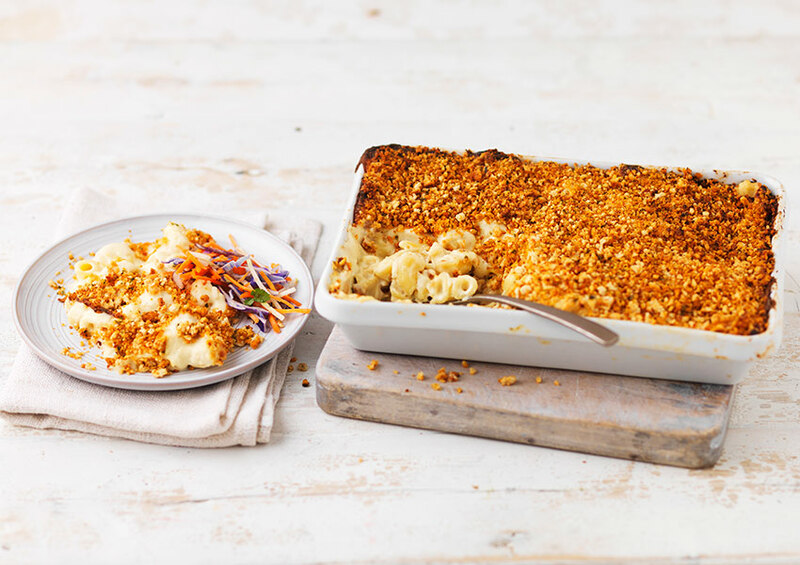 Try this dish of free range egg gobetti pasta bedded in a vintage cheddar cheese sauce, topped with mozzarella and paprika breadcrumbs to finish. Semi Skimmed Cows' Milk, Cooked Gobetti (31%) (Durum Wheat Semolina, Water, Free Range Egg), Vintage Cheddar Cheese (Cows' Milk) (10%), Single Cream (Cows' Milk), Premium Harvest™ Breadcrumb (Country Ground™ Fortified British Wheat Flour (Wheat Flour, Calcium Carbonate, Iron, Niacin, Thiamin), Yeast, Salt), Farmhouse Extra Mature Cheddar Cheese (Cows' Milk) (4.5%),Water, Mozzarella Cheese (Cows' Milk) (2.5%), Extra Virgin Olive Oil, Fortified British Wheat Flour (Wheat Flour, Calcium Carbonate, Iron, Niacin, Thiamin), English Mustard (Water, Mustard Flour, Salt, Fortified Wheat Flour (Wheat Flour, Calcium Carbonate, Iron, Niacin, Thiamin), Turmeric), Cornflour, Sea Salt, Smoked Paprika, Parsley, White Pepper, Nutmeg.